In 1859 Charles Dickens published Volume 1 of the first 26 of his ” Weekly Journal with which is incorporated Household Words” These journals became world famous as they carried his novels in weekly instalments. Volume 1 contained ‘A Tale of Two Cities’ as its lead but also contained several other pieces written by Dickens. Of particular interest to us is Issue No. 23 published on Saturday October 1st 1859. Immediately following that issue’s part of ‘A Tale of Two Cities’ there is an article entitled ‘A Week with Wodderspoon’. One has to read almost a quarter way through the article to find out exactly what that intriguing title actually means. 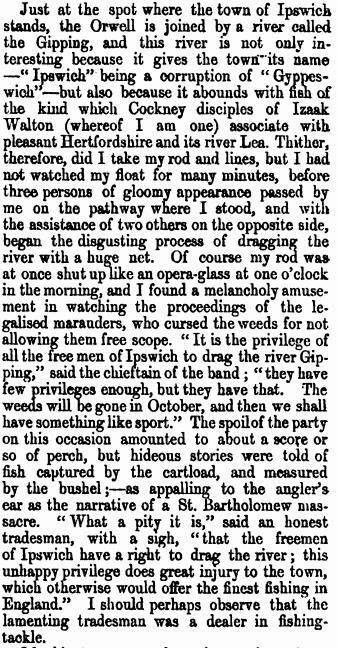 In 1859 Charles Dickens decided to visit Ipswich and spend a week looking round that fair town. He traveled by boat from London to Harwich and then took a steamer up the Orwell to Ipswich. The book to which Dickens refers is “A New Guide to Ipswich: Containing Notices of Its Ancient and Modern History” and apparently at the time of its publication was well regarded. The book is available to view on line via Google Books from this link. 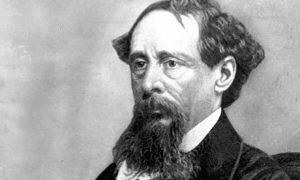 Dickens makes great play with the facts contained in that book which he found somewhat misleading. He would have been quite right to rubbish one particular ‘fact’ quoted below – the way Ipswich got its name. It has absolutely nothing to do with the River Gipping because that river was known as the Orwell long after Ipswich grew into a sizeable town. In fact the ‘Gyppes’ part probably comes from the name of a local Saxon chieftain.